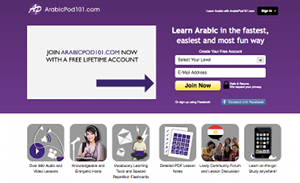 ArabicPod101.com is a site with hundreds of short instructional videos for learners of Arabic. There is material available for all different levels. I have read very positive reviews about this service, and the paid subscription, which gives you access to all the videos and also to accompanying printed material, seems to be a good deal. There is also a free subscription giving you access to only a portion of their features. Here’s their pricing page. These are all appropriate for the beginner. The variety of Arabic used here is a somewhat more formal Standard Arabic than the one used in the Bite-Size Arabic book. The verbs usually have the mood ending on them, and sometimes the nouns and adjectives have a case ending. (They’re not entirely consistent.) The Arabic is also not always error-free. In the clip on saying thank you, for example, they quite surprisingly misspell the word shukran (‘thank you’) as شُكْر rather than the correct شُكْرًا. But in spite of its defects, I recommend this series as useful material for the beginning learner of Arabic. At some later point, I hope to wrtie individual pages about each of these videos with more information about the words and phrases introduced, so watch this space!